Cakes have always fascinated me! I used to love to eat cakes as a child and as far as my culinary journey goes, even before I started cooking, I started making cakes. And I cant tell you how much I love to make great cakes for celebratory occasions. Birthdays and anniversaries always call for special cakes and I’m ever ready to oblige. My husband’s birthday falls in the first week of May. This is a time when stone fruits like cherries, plums, peaches, apricots and ofcourse the mangoes are in abundance and the strawberries have just gone out of season in India, but still available with that one vendor! Over the years I have made many cakes for my husband. Strawberry and Litchi Cake, Mango Cake, Almond Cake, Kiwi Cake, Tropical fruit cake, Cheesecakes and the like. 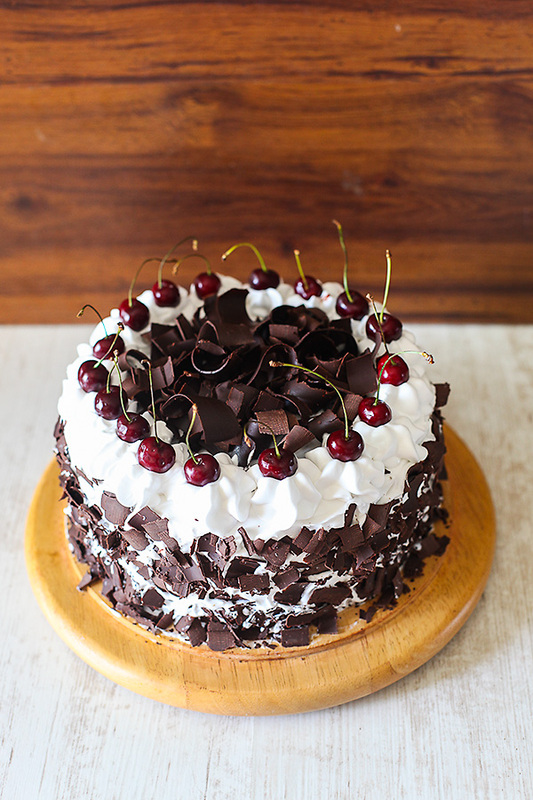 This time I decided to go back to basics and make one of the most popular cakes of all times, the divine Black Forest Cake! 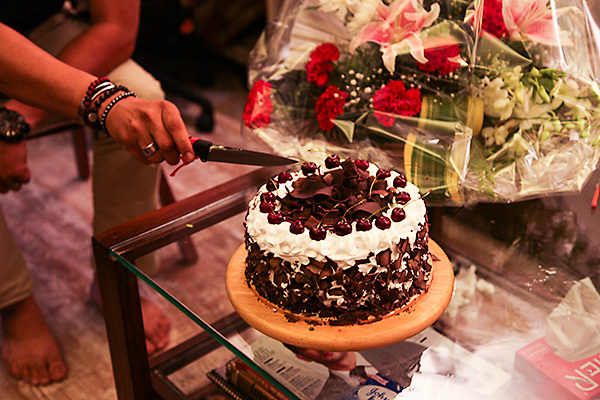 Blackforest Cakes are quite common place now. But, when we were growing up they were deemed quite exotic. A good blackforest or pineapple pastry, which are now available practically in every corner of the bakeries that dot the towns and cities of India were a rare phenomenon back in the 80s and 90s. Despite black forest cake being so common now, I can safely say that a good piece of black forest cake is not so common after all. 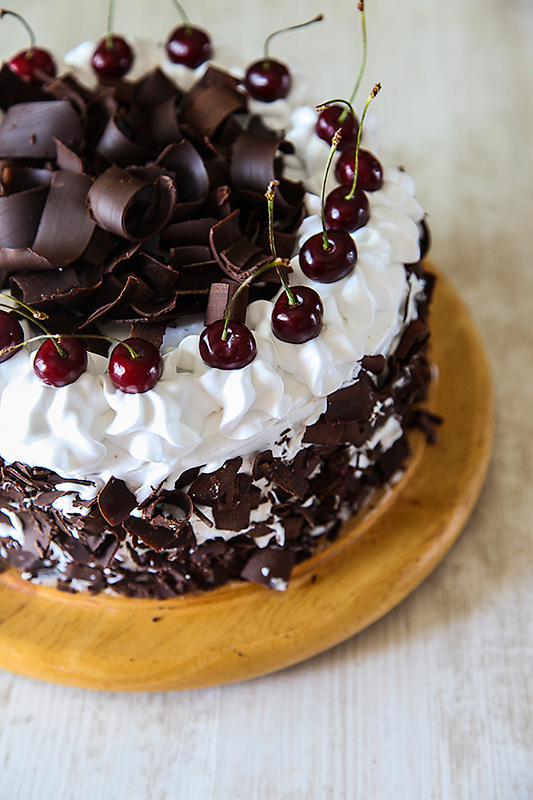 With its origins in Germany, a classic black forest cake will have kirsch apart from the usual elements i.e, chocolate cake, whipped cream, chocolate gratings and cherries. My version of this cake has a delicious cherry syrup which flavours the cake abundantly and gives it a great depth as well. I had a surprise planned for my husband with his friends and this cake was the star attraction. Many of them were not even aware that this cake had no eggs and I did not bother to clarify. The best compliment for this cake came from our friend Uzma Khan, when she said that this was the best blackforest cake she has had! This cake is one of the richest, softest and luscious cakes I have made. 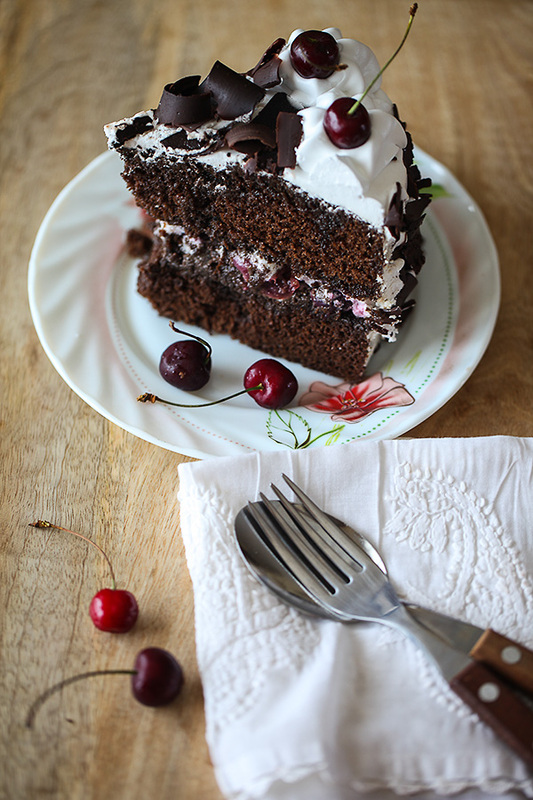 A rich chocolate cake, with layers of fresh cream, slivers of chocolate and cherries- tell me what’s not to love in this classic black beauty? And with these magical ingredients, icing the cake and making it look pretty is a breeze! But don’t take Uzma’s or my word for that matter. Make this and experience the delightful flavours for yourself. Using good quality ingredients, chocolate, cream and cherries is vital to the success of this recipe. Begin by greasing and lining the bases of two 8” round cake tins with greaseproof paper/baking parchment/butter paper. Alternately use a deep 9” or 10” round pan and then cut the cake into layers. If you have only one tin then, you can bake twice using the same cake batter. In a mixing bowl, assemble 200 gm (1 1/2 cups) flour, 50 gm (1/4 cup) cocoa powder, 30 gm (4 tbsp) sugar, 2 tsp baking powder and 1 tsp baking soda, mix with a spoon and sieve once to make the mixture uniform. Add in the condensed milk, 150 gm melted butter, 1 tbsp vanilla and 250 ml (1 cup) water to the flour mixture. Beat with an electric hand mixer, stand mixer, whisk or spoon just until the mixture is uniform and smooth and there are no lumps. This shouldn’t take more than a minute with an electric hand mixer/beater. Be careful not to over beat as this tends to stiffen the batter which might lead to a less softer cake. Pour the batter into the prepared cake tins and bake for 25 to 30 or until a skewer or toothpick comes out clean. After the cakes are done, allow them to rest in their tins for 3 to 4 minutes and then invert them on to a cooling rack. When the cakes are baking, make the cherry syrup. 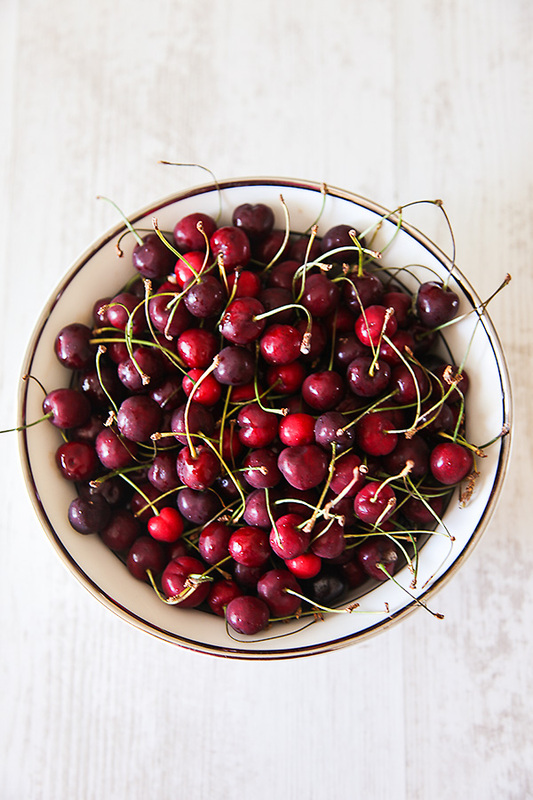 In a small saucepan, you need to put in 175 ml (3/4th cup) water, 4 to 5 tbsp sugar and 1 cup of pitted cherries. You have to heat this until the sugar dissolves and begins to boil. After the syrup boils for 2 to 3 minutes, turn off the heat and allow to cool. After it is cool, strain the cherries and reserve the syrup. While the cherry syrup cools, whip the cream until soft peaks form. Place one half of the cake over a serving plate. Put some cherry syrup all over it. Spread the whipped cream, leaving 1/4” space at the borders. Place the strained cherries over it. 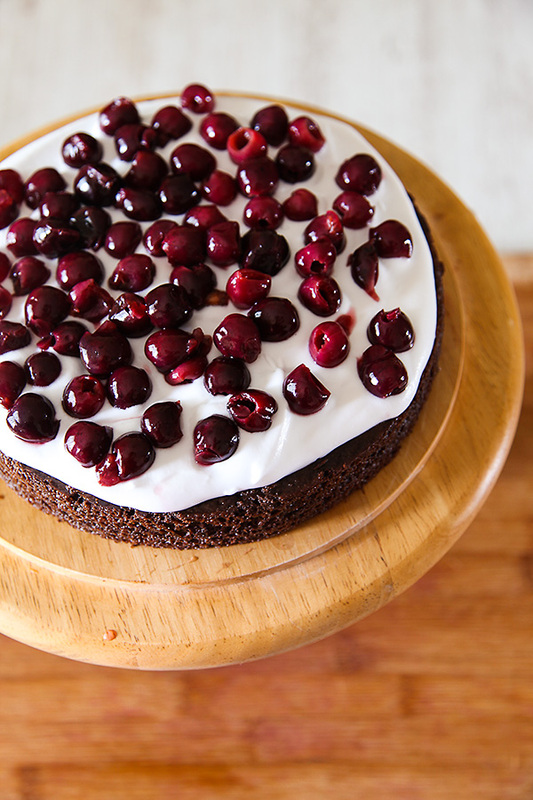 Carefully place the other half of the cake and moisten it with the cherry syrup. With the help of a palette knife level both the cakes, by pressing the knife over the sides, rotating the cake at the same time. Spread the whipped cream on top of the cake and cover it over the sides as well. With the help of a cone and an icing nozzle place stars or rosettes on the edges of the cake. To make it prettier, place a cherry on the top of each design. With the help of a vegetable peeler, peel a bar of chocolate to get chocolate curls. Place some chocolate curls in the centre of the cake. If the temperature is hot, then you can chill your chocolate and that will make it easier to shave off the chocolate. Place some mini chocolate curls on the sides of the cake as well. Chill in the refrigerator for about 2 to 3 hours before slicing. I have used a sweetened soy whipping cream to make this cake. For plain whipping cream, use 2 to 4 tbsp icing sugar for every 1 cup whipping cream. Use 1/2 tsp vanilla extract for 1 cup of plain whipping cream. Mix all the ingredients together and whip until desired consistency is achieved. BRILLIANT! Thank you for that lovely Birthday surprise and wonderful cake! Guys, like Anushruti mentions in her post, please do NOT take Uzma's or my words, as the proof! As they say – The Proof Of The Caking (for want of a better word! ), is in the baking and thereafter eating! Bake it, eat it, share it and then, you shall realise, why this WebSite is called – DIVINE TASTE! The taste of perfection, is still lingering in my mouth, even after close to two months of having eaten it! Hi how r u dear? After long time I received this mail. Thanks for the receipe. My son's Birthday is on 3rd July, I will try. This is indeed divine!! Kudos to you! Clever recipe using the sweetened condensed milk. And again beautiful presentation and photography , so much so that the cake looks touchable ! Quite a simple cake but so divine looking . What could be better, chocolate , cream, syrup/jam and cherries. A delectable combination. Hi Anushruti, a much awaited cake from you. 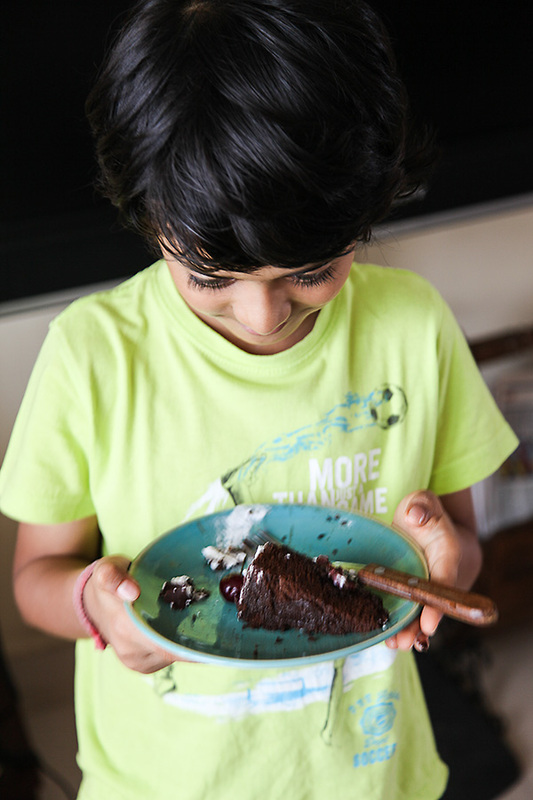 I have till date not attempted to bake a black forest cake,I was waiting for your recipe. And it definitely looks worth the wait. I cannot wait to make this cake.It looks absolutely delicious and divine.Which brand of chocolate and cocoa powder do you recommend for this cake? Also , if fresh cherries are not available will the tinned onesdo* If so then what changes would be required for the syrup? Rohit- Thank you for the first comment. Usha- I'm ok, thank you. My hard disks including back ups have crashed and I'm also moving into a new software so my entire workflow is in a state of disarray. Hence, the delay. Hope your son had a great birthday! Alexa- You are absolutely right! Thank you for visiting! Himani- I'm absolutely touched to hear this. Use the best quality cocoa and chocolate that you can lay your hands on. 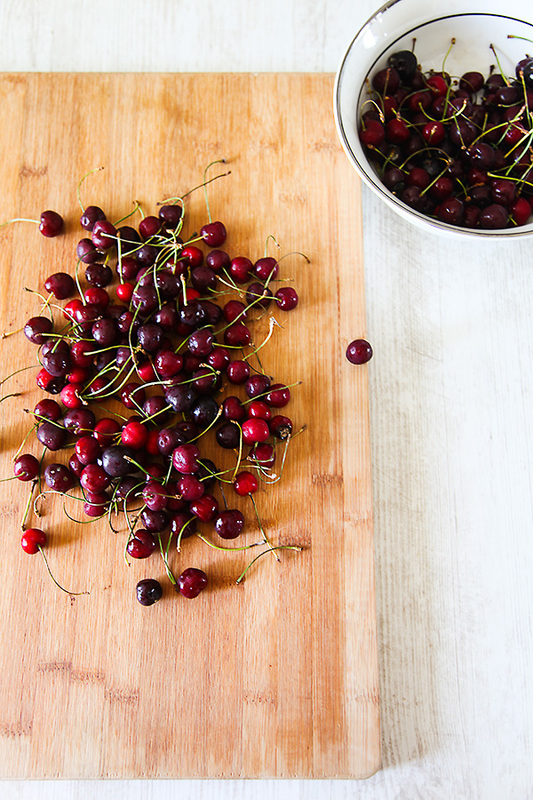 If fresh cherries are not available, use tinned cherries. 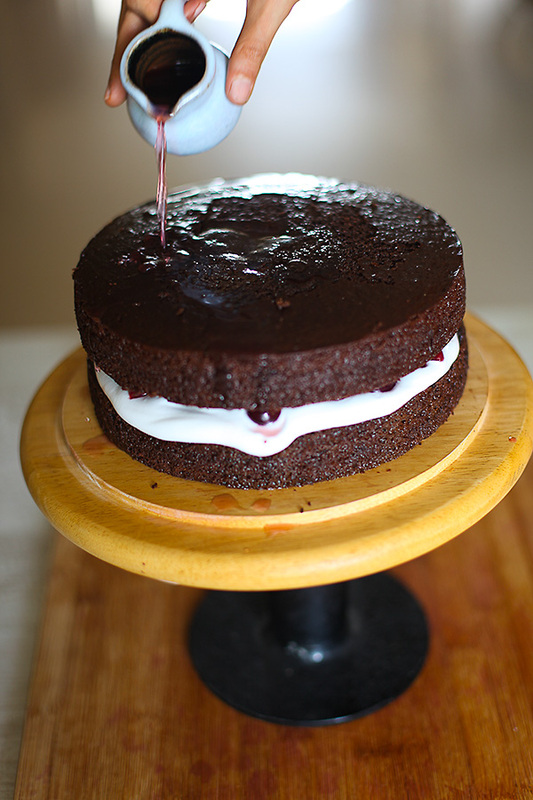 You can make a simple sugar syrup (see my chocolate ganache cake) or use the syrup of the cherries to moisten the cake. Hi Anushruti…. I would say you are the crown jewel of all the bloggers. If we type vegetarian sattvik recipes… divinetaste comes first. This is already your victory… Victory over us your reader. Tried the recipe,turned out perfect. Thank you. The Básic eggless cake with condensed milk and Approx. 250 gms flour, why dies The quantity Of butter changes, i Have noticed that On chocolate cake Your recipes call For more butter than vanilla cake, can You explain please. The first word which came out of me was "wow". The cake is looks so rich, luscious and DIVINE! None of the black forest cakes i have seen has mesmerized me the way this cake did. I was admiring the cake for so long. Treat for eyes. You are an exceptional cook Anushruti! I made this recipe yesterday, as part of my quest to make perfect eggless chocolate cake. And guess what this has turned out to be the most perfect, moist yet crumbly cake i have ever made from scratch. So a big thank you for giving a such an accurate, detailed and perfectly tuned recipe. Just one question though am planing to make this cake for my sons birthday, but it will need to be prepared in advanced like a day. So will the icing hold in fridge over night. Or should I ice the cake few hours before the event. Anu, The cake looks very rich. Much more than any regular black forest. You should own a patisserie. Specially those cherries and chocolate shavings look rich. 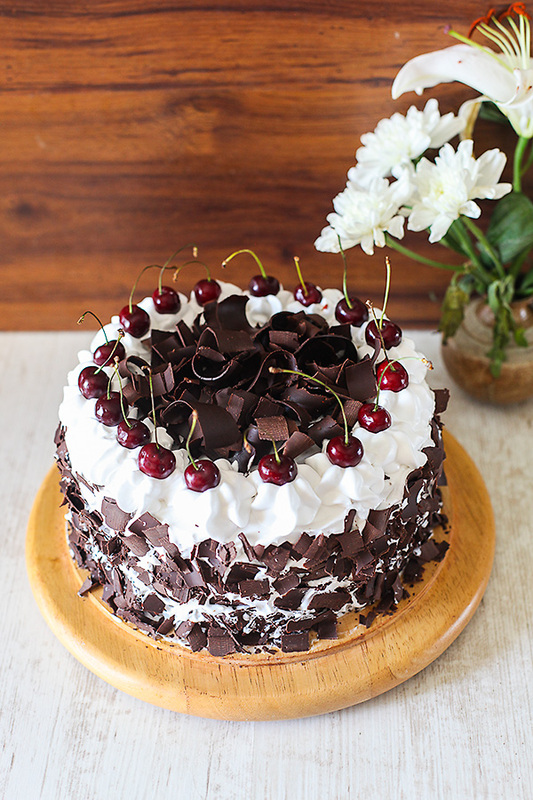 I haven't seen a black forest cake so pretty. From where do you buy such pretty cherries and those awesome looking chocolate shavings? Any online links? You r awesome cook. Liked ur bannana bread. Want some help in making of bannna bread without oven. Plz plz if u can share any recipe .it will be a lot to me.thanks. Also, would it make the cake more rich if milk is used instead of water? 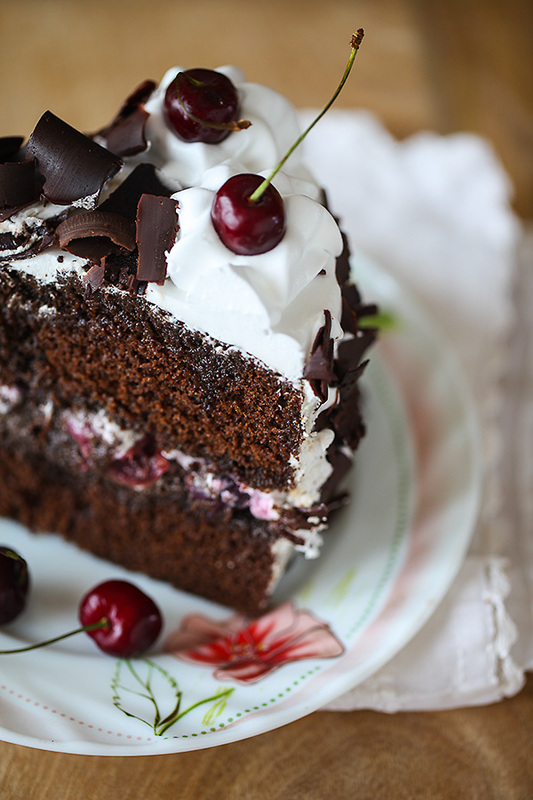 Black forest cake is my absolute favorite. Can't wait to try it.thanks for posting the recipe! Was waiting for this ever since i started baking cakes using your recipes. a must try and looks fabulous as usual. Thanks once again. juswant to clarify whether u added any sugar to the whipped cream or used it plain. Your silent follower is back with experimenting cakes. I tried this one and what I did was that I baked it in 2 times as I have just one oven and the size is such that only one cake can adjust. I seived all the dry ingridients and kept 1 cup aside. Similarly, I did with the wet ingridients and changed the sizes of time to make a 2 layer cake. The first cake did not get cooked in 40 minutes also. Also, after 40 minutes, the cake sank from centre. It is cooked but looks like more of a brownie. The first word which came out of me was “wow”. The cake is looks so rich, luscious and DIVINE! None of the black forest cakes i have seen has mesmerized me the way this cake did. I was admiring the cake for so long. Treat for eyes. Rameshwari- Thank you for your kind words. Always a pleasure to hear from you! Vidya- Thank you for the feedback! Deepa- I have formulated each recipes here to give the best flavour and taste. The quantity of butter in a recipe depends on many factors. Darshana- Thank you for your wonderful words. Please see the video to see how to make the chocolate curls. Himu- Thanks for your positive feedback. You can make the cake a day in advance. Pratiba- Thank you! Maybe someday I will! Please see the video where I have shown how to make the chocolate curls. I got the cherries from my fruit vendor in Mumbai. Hope this helps! Manish- Thank you! I will try and put up a recipe for a cake without oven. 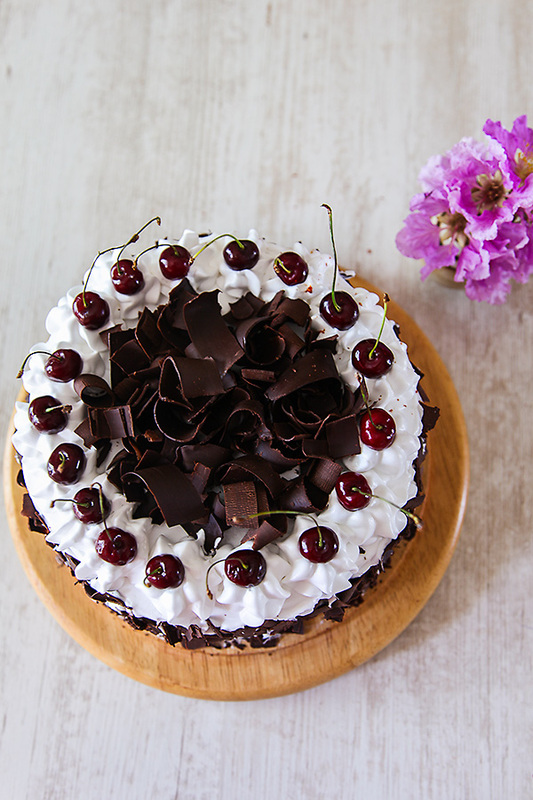 Sree- Cherries are an intrinsic part of Blackforest cake. You can use tinned cherries if you cant find fresh ones. That said, you can use any fruits of your choice and give it your own twist. Shobana- Glad to know that. I used Rich's Gold cream which already has sugar in it. If you are using whipping cream without sugar add in the sugar. Richa- Please make the batter at one go! Keep the batter aside until the first one finishes baking. The Monk- Thanks! Hope your MIL loves this cake. You are truly blessed and all your creations are absolutely DIVINE! I say this because I have more than once tried your recipes (baking) and delighted my family and friends alike…and at all of my attempts with your recipes I was royally spoilt with appreciation. This 25th marks my daughter's first birthday and to mark this occasion I'm planning to give this recipe a try. Big Thanks to you for all the goodness you keep sharing. Can this recipe of urs can b tried in a cooker….? Dear Anushruti, I made this as a single plain cake for some special guests in my house today. Though I have been baking with your recipes in the past, this cake got me so much appreciation that I am feeling awed by your perfect recipes. I have no words to express my sincere thanks to you. Thank you so much for spreading positiveness in all our lives through these delicious offerings. Reena- Thanks for your warm words. Hope your daughter's birthday went well. Avika- I'm sorry, I havent tried this recipe in a pressure cooker. Jayashree- I'm so pleased to hear this! Thanks for sending positivity my way! I hope I can go on serving delicious recipes always! Can you please do an eggless love cake? Dilekha- Sure. Will keep that in mind. Today is my husband's birthday and i made this cake for him.It was so nicely explained that it came out great.So,a special thanks to you. Will surely try other too. Sujata- You are welcome! I'm happy to hear about the success of this cake. Hey! I'm planning to make a black forest cake for my birthday . So I wanted to know which cocoa powder have you used for this? I have Weikfield one, will that work? or any specific brand that you'd like to recommend?and yes this cake looks stunning and i can't wait to try it! Isha- You can use any good quality cocoa powder. I use hintz or hersheys. Regarding the cake tins…..8" dia-How much depth is okay for one cake base? Roopa- A regular 8" tin will do. At the moment,I feel so convinced about your recipe. I am going to try this for my son's birthday. Can I use a whole wheat flour instead of plain flour? If yes, would all other ingredients' measurements still hold the same? Divya- Yes you can use wholewheat flour. But the cake would be dense and a little crumbly. Using plain flour occasionally is not that bad. Happy birthday to your son. I tried this recipe for my friend's Birthday and the cake tasted amazing. Thanks a lot for the recipie. Even without the icing it tastes super yummy. Has all the qualities of a cake..yummy, soft and moist.Thanks alot!! Richa- Thanks for the feedback! 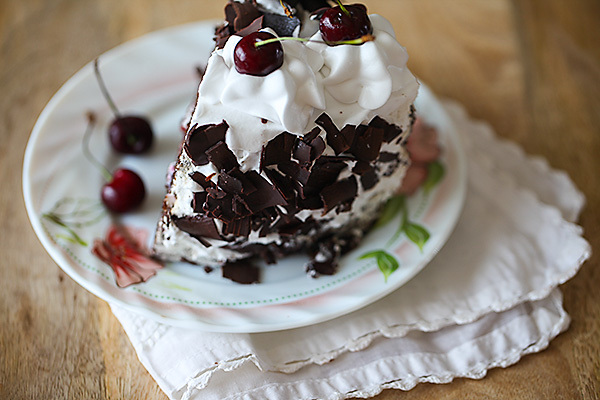 Black Forest Cake is my all time favorite and I have made this cake many times. This is so delicious cake and I would say one must try this. It is so easy to bake. Thanks Madhu for sharing your best work here. Hi, if I need to make a smaller cake, can I just reduce the quantity by half? Also, while whipping cream, when should I add the sugar? It will be my first attempt to try and bake a cake….so, any help is appreciated. Thanks. You need to mix the icing sugar with the cream. Please check the recipe for more detailed instructions. Hi Anu, tried the cake with half the measurements and it came absolutely great. Pls check your pinterest pin to see the pic. Also, I tried making it as a cupcake and with a cooking time of 15mins baked perfectly fine. Now, I got one recipe that's gonna be made many more times….a perfect one I should say. Thanks a ton. So happy to know this Padmaja!